These days, so much of what passes for soul music falls short of the spiritual alchemy that hallmarks the best of the genre, throughout its long history and many permutations. That is to say: there just ain’t a lot of soul in would-be soul music anymore. 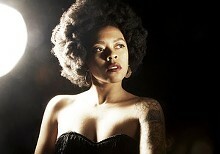 Behold the antidote: North Carolina singer-songwriter Nikki Hill. While Hill’s sound is actually a rootsy mashup of rock n’ roll and old school r&b (think Tina Turner), her immense vocal instrument gives her music a haunting and electric soulful quality. Her voice, like the bygone greats in the tradition in which she is most properly fixed, is capable of shaking the listener loose from the humdrum frame of the moment passing and dragging them into the emotions she’s rendering, the stories she’s telling. Check out Hill’s excellent recorded output, in 2013’s Here's Nikki Hill and 2015’s Heavy Hearts Hard Fists, for a taste of her gift. In a world that can seem increasingly arid emotionally, Hill is a presence that beseeches and exemplifies pure passion.